Science & history documentaries can be a fabulous homeschooling resource. But, for many homeschool families, it can be difficult to find quality documentaries. 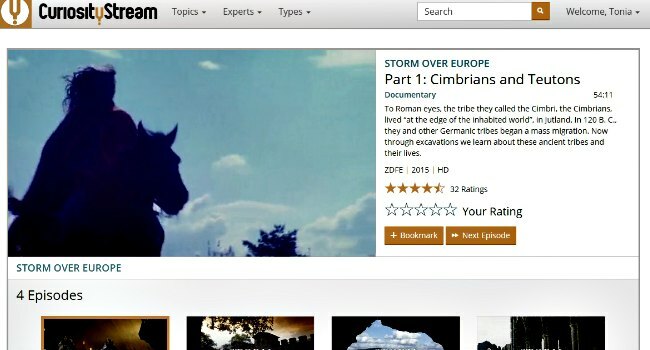 Now, with the release of CuriosityStream, you can find plenty of wonderful streaming documentaries for your homeschool. Best of all - it's available around the world! I received a free membership to CuriosityStream. I was compensated for the time spent reviewing the website & writing this post. I was not required to write a positive review. All opinions expressed are my own. CuriosityStream is a fabulous (the first of it's kind!) ad-free, on-demand streaming service that provides quality documentaries from around the world. With over 1,000 films and series, you can watch whenever and wherever you want. Whatever you are studying, you'll most likely find a few documentaries to round out your studies. The creator of CuriosityStream, John Hendricks, is also the man behind the Discovery Channel - so you can be confident that he knows how to source quality material! I live in Canada and have access to CurosityStream's international site, so this review will speak to that experience. If you live in the US your experience may differ slightly. When you create your account (you can try it free for your first month - that will certainly give you a good idea of the wonderful quality of these documentaries), there are two payment options. A basic account with standard video ($3.99 per month - $2.99 in the US) and a standard account with high-definition video ($6.99 per month - $5.99 in the US). Once your account is created and you login, you can start bookmarking the documentaries that interest you. You can use the search bar or look through the available videos searching by Topic, Expert, or Types of videos. 'Type' & 'Expert' also pull up other search options - you'll find specific people and types of video - interviews, lectures, documentaries, and performances. Don't forget, while you're scrolling through all those fabulous videos, to bookmark your favorites. You can keep track of the videos you've bookmarked or watched under your account information. You'll also find that there are lots of ways to access your account. Of course, you can watch on your laptop or hook your laptop up to your television. CuriosityStream is also available on Roku and on your Apple & Android devices - you'll find apps available in both markets. You can take your learning on the road - for those busy homeschooling days! Ad free - I LOVE that feature! My daughter is in middle school now - which is a great time to watch and discuss documentaries. Whatever topic we're studying, I can quickly search through the available options on CuriosityStream and find a variety of videos (it's such a timesaver!). We watch and discuss, comparing the point-of-view to what we're learning from our reading and other resources. It's working very well - and is perfect for middle school! On the last day of school each week we have 'Fun Friday' and do all the activities that don't seem to fit into our week. It's also TJ's day to pick an educational video to watch. Her favorite thing to watch is videos about animals - and there are lots of choices on CuriosityStream. We plan to get lots of use from our CuriosityStream subscription and definitely recommend it for other homeschool families. It's a great resource with lots of quality videos for a minimal monthly price - and best of all, it's ad-free! Ready to give CuriosityStream a try? CuriosityStream is offering my readers a 15% discount on their first two months. You'll get your first month for free AND your 2nd and 3rd months will be 15% off the regular price - that's quite a nice deal! Use the code: homeschool to take advantage of this offer (expires Nov. 1, 2015). You can follow CuriosityStream on Facebook, YouTube, and Google+.